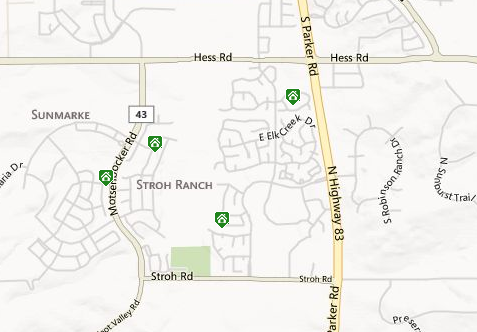 Stroh Ranch is located West of US 83 (Parker Road) between Hess and Stroh in Parker 80134. These homes were built from 1988 to 2005 and is a popular neighborhood. the newer homes to the West of Stroh Ranch actually have this as their legal description, but the neighborhood is called Anthology. This is a pool community with a very nice community center and located within the acclaimed Douglas County School District. Residents love the clubhouse! There are approximately 1,292 homes in this neighborhood. You will find homes from 1,130 square feet to 4,363 square feet with finished basements. There are ranch homes, two story homes along with tri-levels and 4 levels frame built with brick. Homes have 2-7 bedrooms and have basements with 2-3 car garages.